In honor of the Vancouver 2010 Winter Olympics and Paralympics, Lonely Planet is offering a free iPhone city guide application to the host city-- from now until March 1st, 2010. 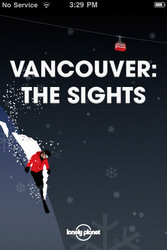 In honor of the Vancouver 2010 Winter Olympics and Paralympics, Lonely Planet is offering a free iPhone city guide application to the host city. Travelers can get the low-down on all Vancouver has to offer in the mobile app "Vancouver Travel Guide: The Sights". This free application can be downloaded via the iPhone's application store or on iTunes. It is available now through March 1st, 2010. As this spectacular city gears up for the games, there is no better time for visitors to have all of its sights at their fingertips. From UBC Thunderbird Arena and the Pacific Coliseum, to the Vancouver Art Gallery and the Capilano Salmon Hatchery, Lonely Planet has listed over 70 top sights and shows where they are using location-aware maps. Plus, by tilting the iPhone, users have access to fun facts on Vancouver, special tips on what to do, see or eat, photos and much more. Lonely Planet Vancouver author John Lee will be running a daily blog throughout the Winter Games at lonelyplanet.com and tweeting through @lonelyplanet, focusing on the experience of being in Vancouver in the middle of the Olympic party.